And no we didn’t enjoyed this in Japan but in Taiwan instead, unsurprising actually given how high the standards of Japanese food are in Taiwan, owing to the proximity of these two countries and the sizeable proportion of the Taiwanese population who are true blue “nipponphiles”. 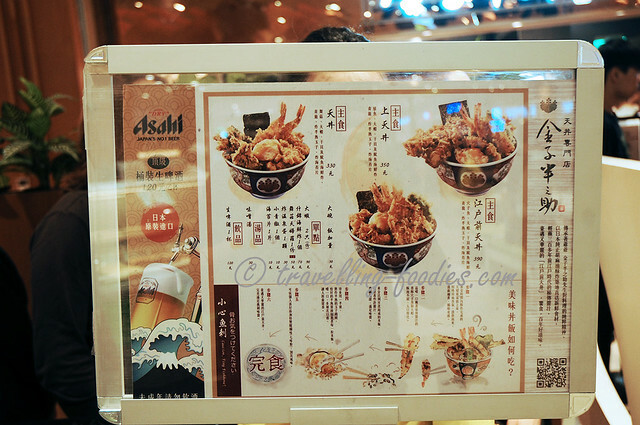 We have had Japanese food in Taiwan on countless occasions and truth be told, few have really disappointed. 金子半之助天丼 Kaneko Hannosuke Tendon heralds from Tokyo with their 本店 “honten“flagship shop located at 日本橋 Nihonbashi which purportedly attracts a huge crowd at its doors who start to queue way before opening hours. Well, the outlet we’d visited is at the relatively new 三井 Mitsui Outlet Park located at 林口 Linkou which is just a 40 min bus ride away from Taipei City. 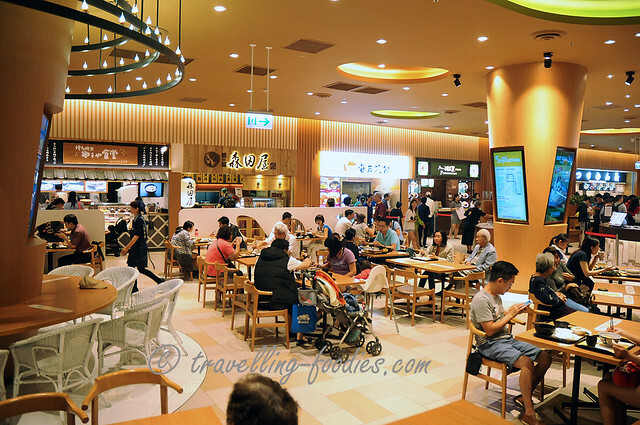 Surprisingly it is not a proper dine-in restaurant on its own but within a food court which showcases a range of “famous stalls” from all over Japan as well. And of all the stalls, Kaneko Hannosuke’s draw the largest crowd, forming a winding long queue which had to be divided into two sections for better crowd management. Despite the number of folks in queue, the service was rather prompt and swift, given the number of cooks in the kitchen working with clockwork precision. The menu is kept small, with three choices for the tendon and a selection of side dishes which one could add on to make one’s meal more interesting. 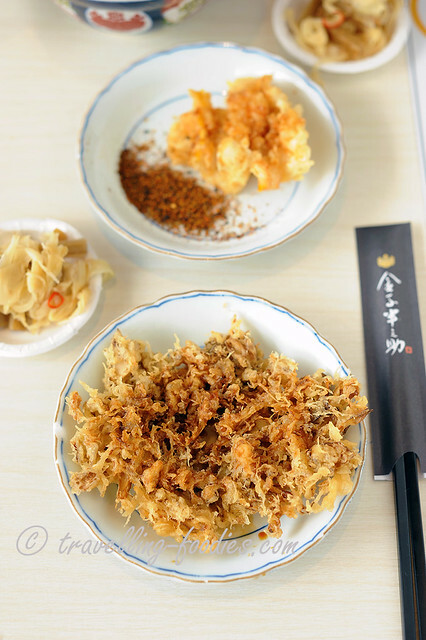 Needless to say the most popular item is Edomae tendon 江户前天丼. 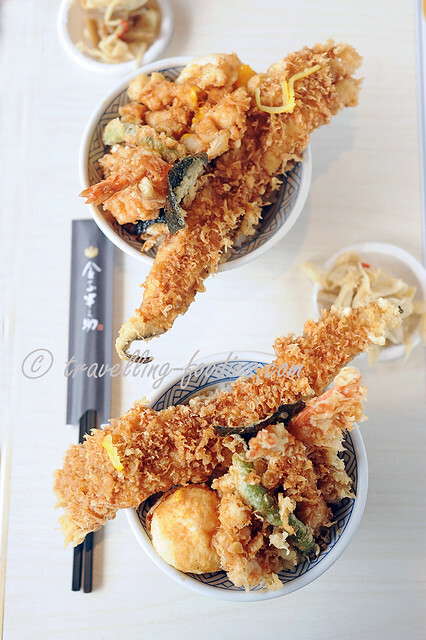 Each bowl of Edomae tendon is overflowing with goodness which readily casts other versions of tendon elsewhere in its shadow. One would find a kakiage of scallops and chopped squid, a piece of ebi tempura, battered green peppers, a fried onsen tamago, a piece of battered nori seaweed and most most importantly, an oversized piece of whole anago. 江户前穴子 Edomae anago is a species of conger eel which thrives in the coastal regions of Tokyo Bay and hence named so after the old geographical name of the area, i.e. 江户 Edo. The quality of conger eels here is said to be one of the best in all Japan, owing to the richness of the water that flow from a number of rivers in Tokyo as well as neighbouring Kawasaki and Chiba into Tokyo Bay. The sweetness of the fish makes it one of the prominent features of 江户寿司 Edosushi, the style of sushi making in the Kanto region and needless to say, it finds itself into the bellies of the locals through other means of cooking as well, including being battered and deep fried tempura style. 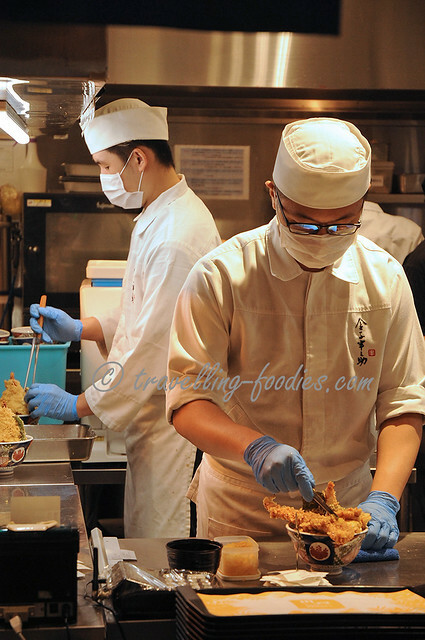 What makes Kaneko Hannosuke’s tendon outstanding for us compared to the rest we’d tried, including the famed 大黑家 Daikokuya in Asakusa Tokyo is really the quality of every individual piece of fried item into the bowl. Each piece had been carefully prepared and fried to perfection before being arranged into the bowl above a bed of rice, Koshihikari to be exact. Everything seems to be in perfect orchestration, from the crispness of the crumbs to the textures and doneness of what lies within. Every detail was taken care of and accounted for, from the positions of each piece laid down over the rice, comparable to an almost ikebana like artform, to the amount of sauce that is to be drizzled over the pieces, just enough to yield the crumbs ever so slightly as they soaked in the sauce yet remaining delightfully crisp. The onsen tamago too was beautifully fried with the exterior nicely browned while the insides remain really lava-like. They take great pride to ensure everything to be in good order or they would replace it immediately, as what happened to mine when the fried half-boiled egg had broke to unleash an avalanche of its golden yolk before the donburi bowl was placed on my tray. They were really apologetic about it and gave another fried onsen tamago on the side which I didn’t mind of course! There is a yellow sliver of pickled yuzu rind placed at the end of each piece of anago tempura, which act as a palate cleanser of some sort to ease any sense of cloying sensation that might have been felt. Overall, we were quite overwhelmed by the quality, bearing in mind that we are eating in a food court after all, and more importantly the thought that had been put in to ensure that every bit in the rice bowl is presented and enjoyed as it had been choreographed. We ordered also a side of maitake tempura, something which we thought would have been interesting as we’d not tried it before. Shiitake tempura yes but not maitake. While it was indeed interesting, we still like the shiitake version better. So it is entirely optional if you should wish to order this as well like we did or to leave it out completely. 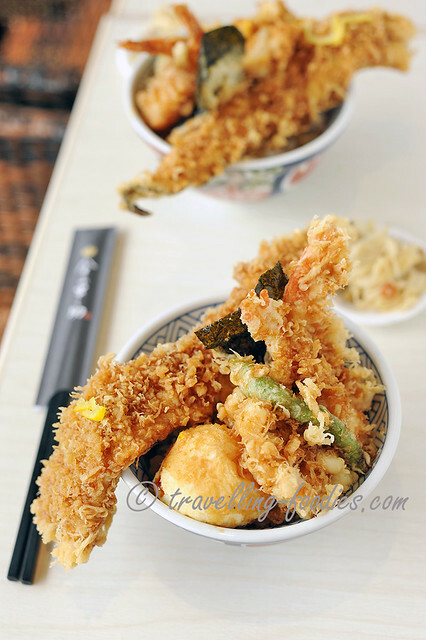 Trust me, the bowl of tendon itself is more than enough to provide a really satisfying meal. 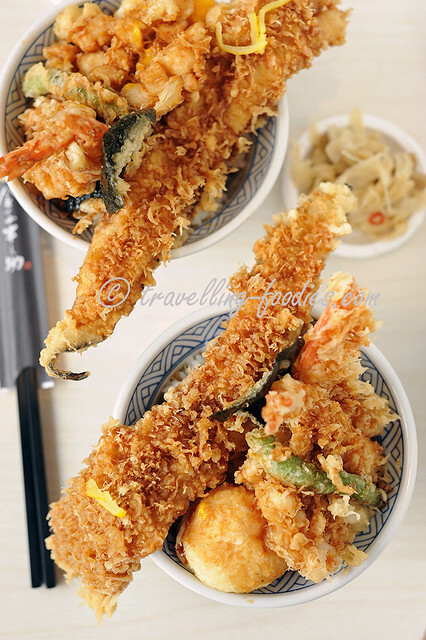 So yes, please make it a point to try Kaneko Hannosuke Tendon a try if you are in Taiwan, especially if you love Japanese food like us. 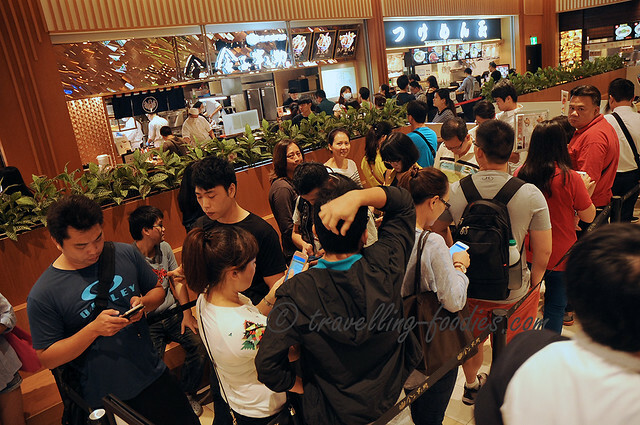 They have currently two outlets in Taipei, the other as a seated restaurant in the food hall at Taipei Main Station, as well as one in Taichung. Otherwise, you can also visit their various outlets in Tokyo as well. This entry was posted on February 25, 2017 by Alan (travellingfoodies). It was filed under General and was tagged with anago eel, edomae anago, edomae tendon, eel, fried onsen tamago, kaneko hannosuke, mitsui outlet park, Taipei, Taiwan, tendon, tokyo bay, 江户前穴子.